The River Thames became a blazing beacon last Sunday night, as London marked the 350th anniversary of the Great Fire of 1666. 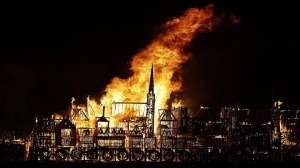 A 120-metre barge bearing 190 replica 17th-century buildings was set alight in the heart of the city in a spectacular event produced by Artichoke as part of London’s Burning, a festival of arts and ideas for Great Fire 350. Marking the Great Fire of London might seem an unusual celebration. After all, the blaze which ended 350 years ago today in Pudding Lane ripped the heart out of the English capital and destroyed around 13,200 homes. But amid all the destruction and death was an event which changed the face of the capital for ever, and gave birth to the modern UK capital which more than 8.6 million call home. What is the Great Fire of London? When was it? It broke out in the early hours of Sunday September 2, 1666 and raged until September 5, causing property damage, death and destruction of the recognisable face of the city. Thomas Farriner’s Pudding Lane ­bakery has been blamed for the Great Fire. A spark from his oven is thought to have started the ­inferno that obliterated 350 acres. From Pudding Lane – off Eastcheap, near London Bridge and the Monument, in the historic City of London – it spread until just one fifth of the walled city remained. Knowing the past mistakes is good to learn not to repeat them again. Building materials made at that time were not too good and burned easily. Today, luckily, we have fire-resistant materials and adequated fire protection solutions to avoid these kind of disasters.